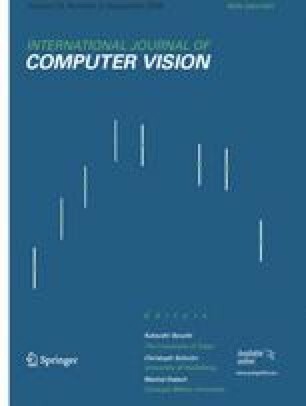 This paper addresses the problem of human motion tracking from multiple image sequences. The human body is described by five articulated mechanical chains and human body-parts are described by volumetric primitives with curved surfaces. If such a surface is observed with a camera, an extremal contour appears in the image whenever the surface turns smoothly away from the viewer. We describe a method that recovers human motion through a kinematic parameterization of these extremal contours. The method exploits the fact that the observed image motion of these contours is a function of both the rigid displacement of the surface and of the relative position and orientation between the viewer and the curved surface. First, we describe a parameterization of an extremal-contour point velocity for the case of developable surfaces. Second, we use the zero-reference kinematic representation and we derive an explicit formula that links extremal contour velocities to the angular velocities associated with the kinematic model. Third, we show how the chamfer-distance may be used to measure the discrepancy between predicted extremal contours and observed image contours; moreover we show how the chamfer distance can be used as a differentiable multi-valued function and how the tracker based on this distance can be cast into a continuous non-linear optimization framework. Fourth, we describe implementation issues associated with a practical human-body tracker that may use an arbitrary number of cameras. One great methodological and practical advantage of our method is that it relies neither on model-to-image, nor on image-to-image point matches. In practice we model people with 5 kinematic chains, 19 volumetric primitives, and 54 degrees of freedom; We observe silhouettes in images gathered with several synchronized and calibrated cameras. The tracker has been successfully applied to several complex motions gathered at 30 frames/second.